It’s over, Dreamforce that is, and I have gotten some needed sleep on the flight back to Boston. As I contemplate Dreamforce 2012 and its meaning I have three observations. First, it was what I expected it to be. If you refer back to my post just before the show opened my expectations were more than met. You might wonder about the timing of that post but I was under NDA and unable to say much till then. The company introduced a slew of products and services but aside from the formal introduction of the Marketing Cloud and things like Chatterbox, they were mostly evolutionary additions to the core products. Instead, Marc Benioff’s keynote was long on customer stories and interviews with CEO and CIO types. All of this was good and in line with my contention that Salesforce needed to present a case to Fortune 500 executives that the social enterprise is real and that Salesforce is the company to help them march in that direction. If there is one big difference between Salesforce and all other enterprise and SMB companies it is that Salesforce has the vision and the others have, so far, only come forward with product. So I think the company was effective at showing how big companies like GE, Burberry’s, Rossignol and Virgin Group are becoming social enterprises with the help of Salesforce and that was a good thing. It’s worth mentioning that the GE story was more about socializing the man machine interface to give the vendor a better real time understanding of its jet engines’ performance, for instance, and thus to provide better maintenance services. It was a nice demonstration of what’s possible in the Internet of Things, which has not yet grabbed many headlines. At another end of the spectrum, Coke showed how it’s nifty new machines can custom blend beverages and enable a customer to develop a recipe and link it to a QR code for later use anywhere. Also, Virgin will be integrating Salesforce’s social customer service solutions into its customer facing systems including the onboard systems displayed on seatbacks. That was very impressive. And finally, Burberry’s CEO Angela Ahrendts was there for an encore to describe how the company’s new store has socialized the customer buying experience. All very cool and very exciting if you are a C-level person wondering where new growth will come from. Ok, second, perhaps the company’s greatest asset hiding in plain sight is its ISV partners. I attended the partner keynote on Day 0 and was blown away. The meeting took place in a rather large ballroom that was full of partners who wanted to know the latest in the partner program. What impressed me most, was how many applications (1,706 proven apps, 1.4+ million installs) and certified partners there are and what it means going forward. But also, Salesforce has basically doubled its commitment to the partners and is driving big business with them. The partners are incentivized (at least some are) to sell the base product along with their wares. 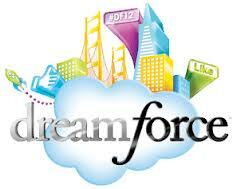 Naturally, this results in great leverage for Salesforce and that will help to further accelerate growth. You can’t underestimate this. The partners have built many, many good applications that all demand the Force.com platform, where they go, Salesforce follows and that should be a good feeling for anyone at Salesforce. It looked to me like the partners are about to hockey stick their way to prominence and that will be good for Salesforce. Finally, I don’t know how many people actually attended. There were 85,000 registrations as of game time on Wednesday and I don’t really care if they all came on the same day or if some percentage stayed home or others did the virtual thing. The event was very well managed so that its size never felt like a problem. That said though, I think the company needs to do some planning that will break the single show into two or more big fragments. An obvious solution might be to have a separate event for partners and technical people while offering another event for business people. Obviously there would be overlap and that’s ok. But I can tell you there was simply not enough time for serious meetings, just meet and greet and agree to follow up. I did some checking and found out that there are 3526 hotels in California and 202 in San Francisco http://bit.ly/SM3cs0 . At some point you just run out of housing and while I suspect the powers that be are tracking this, it’s worth an out loud wonder. Finally (again), there’s the inside baseball. There were no picketers that I saw this year other than a man with a bullhorn trying to convert the known universe to some idea or another. But there was still a silent battle between Benioff and Larry Ellison, Oracle’s CEO. Oracle will take over the space next week for OpenWorld and there are already dueling registration counts. It seems Howard Street has become a battleground of sorts. The street separates Moscone North from Moscone South and people are forever crossing it. In past years for OpenWorld, Oracle has rented the street from the city, closed it and erected a long tent where it serves lunch and holds parties. A tent is a good idea, in case the notoriously fickle San Francisco weather decides to do its thing. In recent years, Salesforce has adopted the practice. But instead of covering it with a tent, Salesforce has built an open-air park complete with jumbotrons, seating, picnic and live music. You can still get lunch there but the Salesforce vibe is all open and green and bucolic even if the grass is synthetic. So even in the street you have a metaphor of the new way to compute which is green and open vs. the old, which is housed in what is reminiscent of an army tent. There were a few other subtleties like that including billboard sized photos of Burberry’s CEO, Angela Ahrendts posed like the Mona Lisa smiling out on pedestrians below. To me it all goes back to the idea of showing CEOs that Salesforce is ready to take them into the land of all things social. What could be a better endorsement than a happily smiling CEO?